Pushtar is a sci-fi feature film by Irish director Alan Lambert. As explained in the opening credits, the film is set in a post-apocalyptic world where climate change has had such a radical effect on the earth that the sky has turned pink, sea levels have risen, cities have been abandoned and oxygen levels have dropped dramatically. Due to this depletion of oxygen, the population’s bodily energy has dropped to the extent where they must use body language to communicate. Lambert was loyal to this implication, and has the characters use absolute minimal dialogue during the film, with the use of body language and signs to interact with each other. Pushtar itself is located along the edge of the Himalayas, a place with volatile weather which the children of the movie can sense, as they seem to have a sense of heightened awareness to atmospheric which the adults just don’t have. The community is run by the ‘elders’, whom settle any disputes or concerns held by the people of the settlement. One interesting dispute settled by them is that of concern about the presence of ‘Pteradogs’ which feature in the film. These dogs are approximately 20ft tall and use half the oxygen of normal dogs. They are the only animals seen in the movie and perhaps this adapted breed is the only species which managed to survive the climate change. The director, Alan Lambert, attended the screening of Pushtar, which was the World Premier. The leading Irish indie director gave a little information on the making of the film during a Q&A, during which the ‘Pteradogs’ even made an appearance. He shared information such as the cameras he used, and ways in which he receives funding for his movies as an independent director. 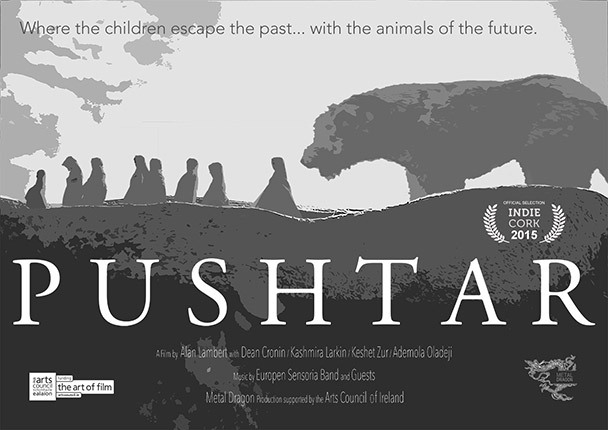 Pushtar was his first movie to receive funding from the Arts Council of Ireland, as well as some support from Fund-It.